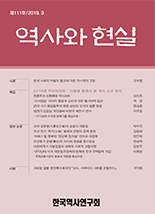 김용흠,(2007).조선 세조대 정치를 보는 시각과 생육신.역사와현실,(64),233-263. During the reign of King Sejo, a series of policies designed to strengthen the ruling structure established during the reigns of Kings T'aejo, T'aejong, and Sejong was developed. Thus, from a policy standpoint, there were very few questions about the legitimacy of King Sejo's rule. Unlike the Sayuksin (死六臣, Six Martyred Ministers), the Saengyuksin (生六臣, Six Loyal Subjects), did not reject Sejo's attempts to assume the throne. Therefore, a compromise grounded in realisnrbased politics could be secured between the two sides. The petition to the throne presented by the Saengyuksin Nam Hyoon represents one such type of compromise. This petition incorporated the belief that the ruling power should be grounded in the neoConfucian based notion of ?iriron (義理論, moral justice). The Saengyuksin laid bare serious issues regarding the collapse of selffarmers and commoners, while also criticizing the abuse of power by the hun'gu (meritorious elite) group. At this juncture, the positive significance of these saengyuksin in the development of history is clearly evident. 세조, 비범한 임금? 평범한 임금!